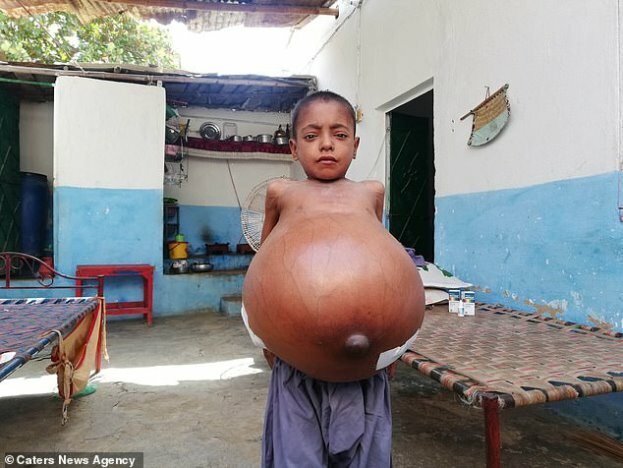 A nine-year-old boy is in constant agony after his belly swelled to three times the size of a beach ball. Aneet Ur Rehman, of Karachi, Pakistan, suffers from Budd-Chiari syndrome, a rare condition which blocks the veins that should drain his liver. As well as causing the youngster extreme abdominal pain and bloating, the syndrome has also led to life-threatening liver failure. Aneet, whose condition forced him to quit his studies, has been told he will die unless he has an urgent liver transplant. But the waiting list for the procedure is long and Aneet's family cannot afford the £35,000 needed to have the operation done privately. Aneet, who has five siblings, was born healthy but started to complain of abdominal pain four years ago. His father Ali Rehman, said: 'Soon his belly started swelling but it was not too big. 'However, in [the] past year it has reached this size. He can hardly walk and sleeps in one position. Aneet's uncle Abdul Rehman, added: 'It is heartbreaking for all of us to see him in this condition. Aneet, who struggles to find clothes that fit him, spends every day at home. His father was working as a plumber in Saudi Arabia but decided to quit and return home six months when his son's condition deteriorated. 'My family [have] taken him to several doctors over the past year,' Mr Rehman said. 'Fluid is being drained from his abdomen every month but his condition is not improving at all. Aneet's family took him to the Sindh Institute of Urology and Transplantation where they were told many patients are waiting for a liver transplant and there is a shortage of donors. Mr Rehman, who is now jobless, cannot afford to pay for his son to have treatment at a private hospital. He has therefore appealed to the public and Pakistani government for donations. 'A liver transplant at a private hospital will cost us nearly £35,000 and even if I will sell out my whole property, I [still] can't afford his treatment,' Mr Rehman said. 'We don't want our son to die like this. We want to see him play like normal kids and have a good future. Dr Arit Parkash, a paediatrician at the National Institute of Child Health in Karachi, said: 'The boy is suffering from chronic liver disease, secondary to Budd-Chiari syndrome. 'The only treatment possible was TIPS (Transjugular Intrahepatic Portosystemic Shunt) procedure but we don't have such [a] facility available here. A TIPS connects veins in the liver to other veins of the body, which then drain fluid from the organ.